By now, you maaaaaay have heard me mention Asana, one of my absolute favorite project management systems out there. I love Asana for many reasons: it’s free, it’s intuitive and easy to learn, and it keeps me out of my email inbox. Having a project management (PM) tool is crucial for any business owner. If you’re a team of one, a PM tool can keep all of your lists and internal to-dos organized so you aren’t wasting time tracking down that piece of paper you used to jot down your notes. A PM tool also allows the solopreneur support in the quest for focus – that elusive skill that holds Shiny Object Syndrome at bay and keeps you on task for your greater goals. If you run a team or interact with clients, a PM tool allows you to converse with your teammates and clients on various projects, store documents all in one place, and add comments, support, and deadlines to tasks as you move thru to the end of the work. While there are a number of incredibly robust PM systems out there, Asana is my go-to for my business and my #1 recommendation for my clients. And although most people use Asana on a very surface level incredibly effectively, there are a few key features that will up your Asana game and bring you (and your team) more efficiency, ease, and even save you tons of time. Think you know Asana? Think again! Asana has a large number of powerful integrations and my two favorite are Zapier and Harvest. Head to https://asana.com/apps to find the apps that you want to integrate. Tasks often cross over from project to project. To save time and avoid having to check the task off twice, assign one task to multiple projects in one place. Assigning due dates and responsible people can become tedious if they are all the same. Why not select them all and assign it just once?! Asana’s robust features go on and on…. and did I mention it’s completely FREE for up to 15 users in an organization?! What I can do #withAsana just grew by 5 times! 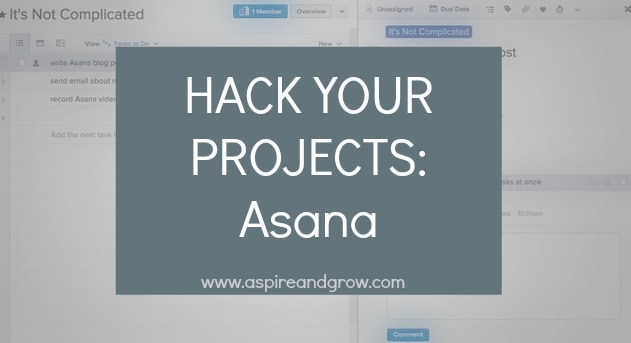 You can then assign due dates, change or add projects, or add subtasks inside Asana. Your turn: tell me in the comments below how you’ll use Asana to save time, money, and a whole bunch of sanity in your business!